Converting solar power into usable energy is not a new form technology, but researchers are constantly finding ways to improve it. In the last year and a half, researchers around the world, including Prashant Kamat, Rev. John A. Zahm Professor of Science in the Department of Chemistry and Biochemistry, have put perovskites in the spotlight, resulting in a cover story on the solar cells in the February 24, 2014 issue C&E News. Many types of commercially available solar cells can reach power conversion efficiencies of twenty five to forty percent. These cells either utilize costly components or employ expensive manufacturing processes, making it difficult for many consumers to easily access this technology. In recent years, other less expensive solar cells using organic polymers have been developed and were originally thought to be very promising alternatives, but these cells have only achieved power conversion efficiencies around eleven percent. Researchers have quickly become excited about the potential for perovskite solar cells because they are created with inexpensive materials and relatively basic preparation methods. In fact, researchers in common wet chemistry labs with standard equipment can make the solar cells. In their relatively short lifetime, power conversions for perovskite cells have grown from a few percent to over sixteen percent. If perovskite cells technology improves enough to become commercially available, manufactures would no longer need the clean rooms and sophisticated equipment used for existing solar cell technology today. The C&E team produced a video explaining the process to create a perovskite cell, which was primarily filmed in Kamat’s laboratory. The entire cover story by Mitch Jacoby can be reviewed on the C&E News website. 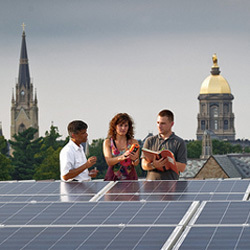 Originally published by Stephanie Healey at science.nd.edu on February 27, 2014.